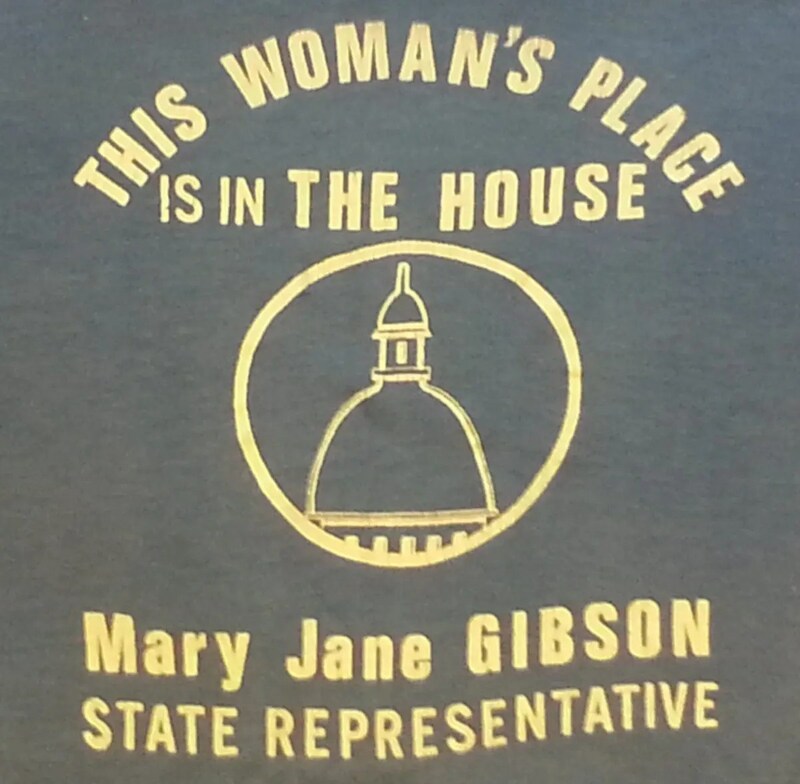 Nathan S. Gibson was the campaign manager for the Re-elect Representative Mary Jane Gibson campaign in 1990. 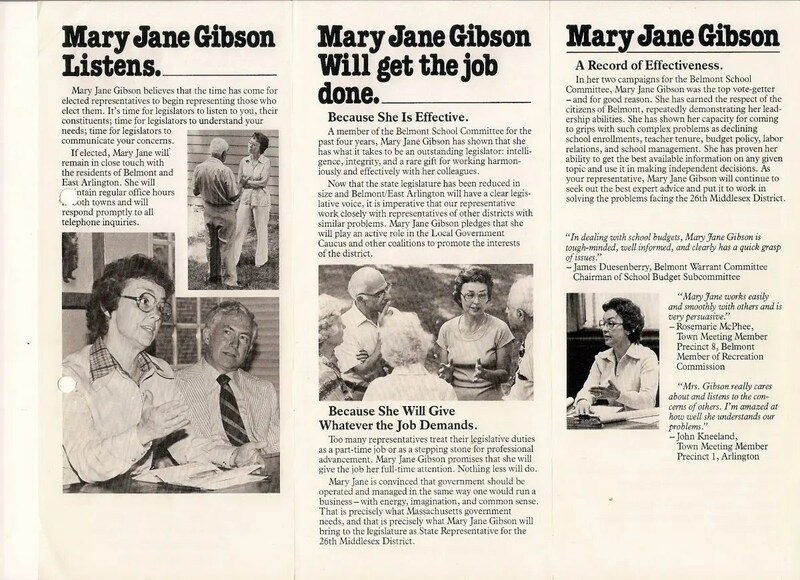 Mary Jane was elected to the legislature in 1978 (see below) and faced a difficult re-election campaign against a strong challenger. Nathan organized Mary Jane’s campaign and led it to success in both the Democratic primary and general election in November. Mary Jane Gibson was born in Commerce, Texas, attended Centenary College in Shreveport, Louisiana and later received her masters degree from Boston University School of Education. She and her husband, R. Jerrold Gibson, moved to Belmont in 1966. Mary Jane and Jerry had 4 children: Rachel, Nathan, Mark and Rebecca. Prior to running for state representative, Mary Jane worked at the Eliot-Pearson Children’s School at Tufts University. The Gibsons also operated (and continue to operate) Gibson Cottages in Eastham, on Cape Cod. Mary Jane was active in the PTO organizations at W.L. Chenery and Winn Brook elementary schools, and Belmont High School. 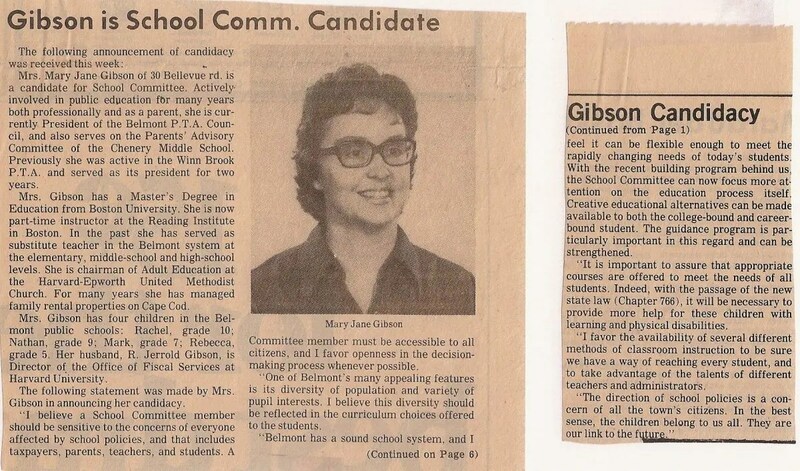 Mary Jane ran for school committee in Belmont in 1974 and was elected. She was the second woman elected to the school committee in Belmont, following Cecelia Norland. In July, 1974, the summer following her election, the popular 70 year old Payson Park Elementary School, was severely damaged in a fire. Many residents, especially those who had attended Payson Park, wanted to rebuild the school. Unfortunately, the site was not large enough for an elementary school and rebuilding on the site did not qualify for state aid. The site was so small that an elementary school would not be large enough to meet basic requirements — there couldn’t be a separate art room, music room or adequate playground space. Belmont had three choices: (1) rebuild Payson Park where it had been without state aid which would be costly to Belmont homeowners; (2) build a new elementary school on the Grove Street playground and lose valuable recreation land; or (3) not rebuild Payson Park and absorb the Payson Park students in other elementary schools. The School Committee hired two demographic consultants — both of whom concluded that Belmont did not need to re-build an elementary school at the Payson Park site and in fact, would require fewer schools in the future. Yet despite the declining enrollment, some residents wanted to rebuild Payson Park. In 1976, Belmont voted against a plan to rebuild Payson Park school (Boston Globe March 7, 1976). Mary Jane did not support re-building Payson Park without state aid because it was fiscally irresponsible. This position, however, was not popular among parents in the Payson Park school district. In 1978, the number of state representatives elected to Massachusetts House of Representatives was reduced from 240 to 160 and all state representative districts were re-drawn. With the reduction of members of the House, the salaries were increased and the expectation was that representatives would be full-time legislators. A new district, the 26th Middlesex District, was formed consisting of Belmont and 5 precincts in East Arlington. Tom O’Brien, who lived in Belmont at the time, suggested that Mary Jane run in the newly created district. With no district-wide incumbent, the open seat was attractive to a number of individuals. There were 6 candidates in the Democratic primary including former selectman Ed Galotti, school committee member Carole Hickey, former Arlington school committee member Elsie Fiore, Belmont Assessor Angelo Borelli, and attorneys Frank Ciano and Jim Sullivan, and Richard McGrath. Mary Jane won in a tight election. She received 1,915 votes — only 21% of the votes cast, but 220 votes more than the next candidate. The 220 votes was only a 2% margin. 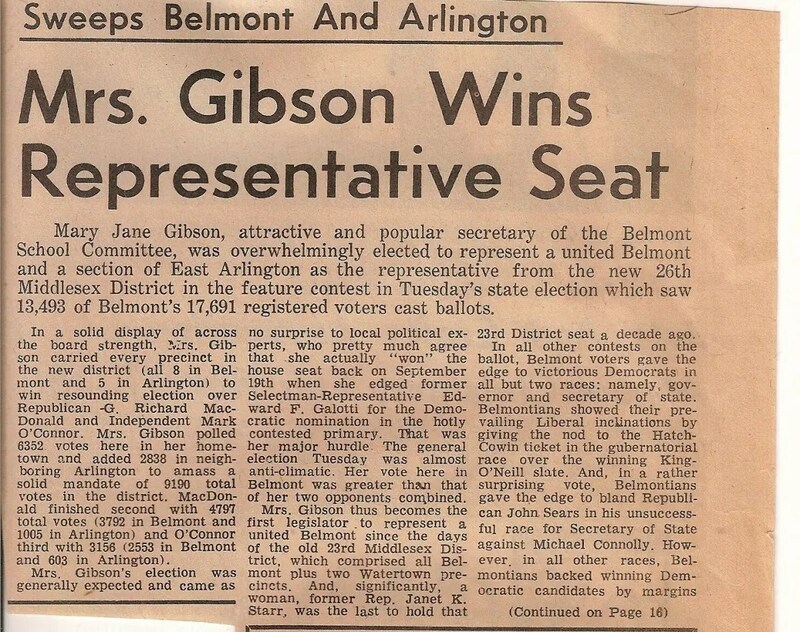 She won in Belmont by 23 votes over Ed Galotti but she received 197 votes more than Galotti did in East Arlington. Ed Galotti received the second most votes in Belmont but but the 5th most votes in East Arlington. Elsie Fiore, a former member of the Arlington School Committee, won easily in East Arlington with almost 1,000 votes — more than twice as many as Mary Jane, but only received 57 votes in Belmont. Elsie finished 5th among all the candidates. 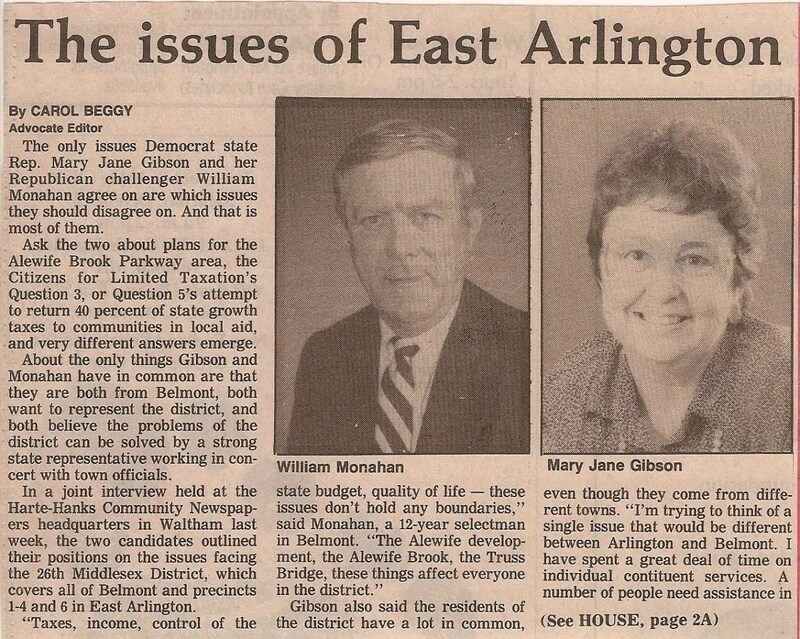 Mary Jane was successful because she worked hard in both Belmont and East Arlington. She went door-to-door in East Arlington in the summer and it paid off. While she finished 2nd in Belmont and 4th in East Arlington, the combination enabled her to be successful overall. In the final election, there was an independent candidate, Mark O’Connor, and Republican candidate, Richard MacDonald, but Mary Jane won easily in the heavily Democratic district. Described in the Belmont Herald as the “attractive and popular secretary of the Belmont School Committee,” Mary Jane received more votes than her two opponents combined. In her first years as a representative, she became good friends with Barney Frank who was elected to Congress, Phil Johnson who served as the Secretary of Health and Human Services in the Dukakis administration, Mike Barrett who later served in the Massachusetts state senate, and David Cohen who was elected Mayor of Newton when he left the legislature.At the time of the 1990 campaign, Representative Mary Jane Gibson had served the district for 12 years, rising to position of Assistant Majority Whip in the Massachusetts House of Representatives and was a trusted adviser of Speaker George Keverian. She served as Assistant Majority Whip from 1985 to 1990. She was profiled in the Boston Globe — described as an activist in the House. While Mary Jane was representative, the Boston mass-transit system was extended to the Cambridge/Arlington line with the development of the Alewife T station. While this was a huge benefit for Arlington and the surrounding area — property values skyrocketed — it presented new traffic challenges and some disruptions for residents living close to the station. Mary Jane worked tirelessly with the Secretary of Transportation Fred Salvucci to mitigate traffic issues. Nonetheless, Monahan used the Alewife construction as a campaign issue. Representative Mary Jane Gibson was running for re-election against Republican William P. Monahan. Monahan had been a Democrat years earlier but had switched to Republican. Monahan was an old-school politician — he would have been comfortable making smokey, backroom deals. 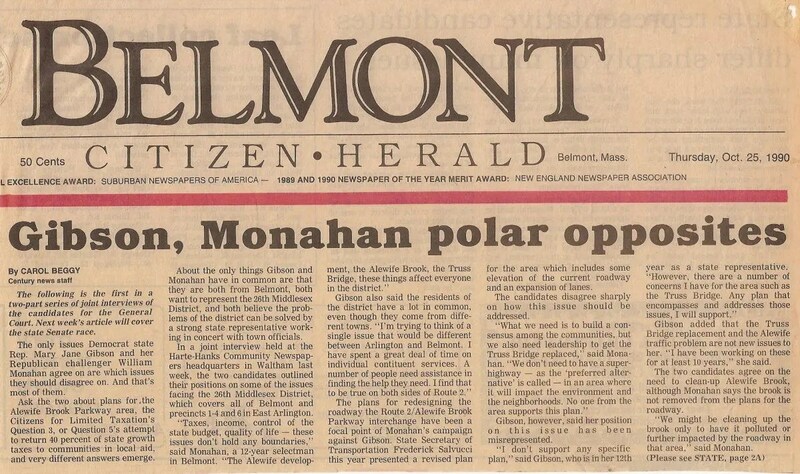 Monahan had been a member of the Belmont Board of Selectman for many years and had previously run for state senate. Monahan was defeated in his re-election campaign for selectman in 2002 by Paul Solomon. Some believe that Monahan’s defeat marked the end of the political divide in the town. Year later, Governor Mitt Romney appointed Bill Monahan to be chair of the Massachusetts Civil Service Commission. Shortly thereafter, the Frank Phillips of the Boston Globe was working on a story about a piece of property that Monahan bought from the Anguilo family, reputed to be deeply involved in organized crime. While later he disputed his resignation, Monahan resigned from his position when speaking with members of the Governor’s staff. Monahan sued claiming he had been wrongfully terminated but the court found that he had resigned. Early in the year, it was clear that opponents viewed Mary Jane as vulnerable. She hadn’t had a contested race in years, she was a member of the leadership in the Massachusetts House of Representatives during a difficult period, the economy was in distress, and she was generally more liberal than people perceived her district to be. A re-election campaign would need to work hard to introduce her to many voters who had moved into the district since her last contested election. Even though she held regular office hours and sent out newsletters, many voters did not pay attention who their state representative was. Nathan developed a campaign plan that was based on contacting each likely voter a minimum of 3 times before the Democratic primary and 3 times before the general election. Nathan’s rule of thumb was 3 to 5 significant contacts were necessary to win. The plan called for two district wide mailings and a house-to-house literature drop before both the primary and general election. Nathan’s plan used the Democratic primary, in which Mary Jane was running against relatively weak opponents, as an opportunity to re-introduce Mary Jane to the votes in Belmont and East Arlington. In addition, the plan called for targeted mailings to particular groups: for example, Dr. T. Berry Brezelton agreed to write a letter supporting Mary Jane and it was mailed to parents of young children in Belmont and East Arlington. In addition, Harvard Law School Professor Larry Tribe agreed to be the guest and speak at a fundraising event and all lawyers in Belmont and East Arlington were invited. Nathan managed Mary Jane’s re-election campaign with the help of many outstanding volunteers: For example, Joanna Hilgenberg coordinated Belmont for the campaign and she did an extraordinary job. Joanna was smart, dedicated and capable and made sure that leaflets were dropped at every house prior to the primary and general election. 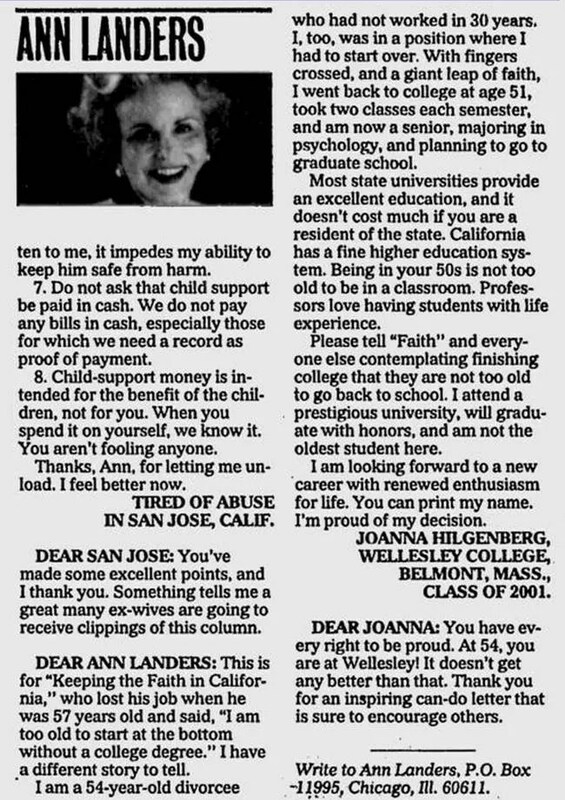 Joanna was a go-getter as shown here by her letter to Ann Landers in 2000. Gloria Milstein and Diana Palmer worked in the campaign office and did a phenomenal job organizing volunteers to address, stuff, stamp and mail two mailings before the primary and two mailings before the general election. Ellen Stevens led the fundraising efforts and raised more than $50,000 for the campaign. Anne Harper was a remarkable treasurer. Mary Jane Gibson won a decisive victory by a margin of 53% to 47% victory over Monahan. In Massachusetts, it was a election with an unusual number of upsets and incumbents being beaten. The Boston Globe reported that “Republicans enjoyed their best election for the Massachusetts House in at least 50 years, boosting their spirits and their numbers….1990 will be remembered as a particularly bad year for Democratic House incumbents” (Boston Globe, November 8, 1990 “GOP Climbs the Hill; 16 Democrats Out of House”). While Monahan presented a strong challenge, it was not a bad year for Representative Mary Jane Gibson. For Governor, Republican William Weld narrowly defeated Democratic candidate and President of Boston University John Silber after Silber had an unpleasant exchange with WCVB-TV newscaster Natalie Jacobson. After the interview, Silber’s poll numbers declined and lost to Weld. Weld became the first Republican to serve as governor since 1974 and started a series of Republican governors that lasted until Deval Patrick was elected in 2006. 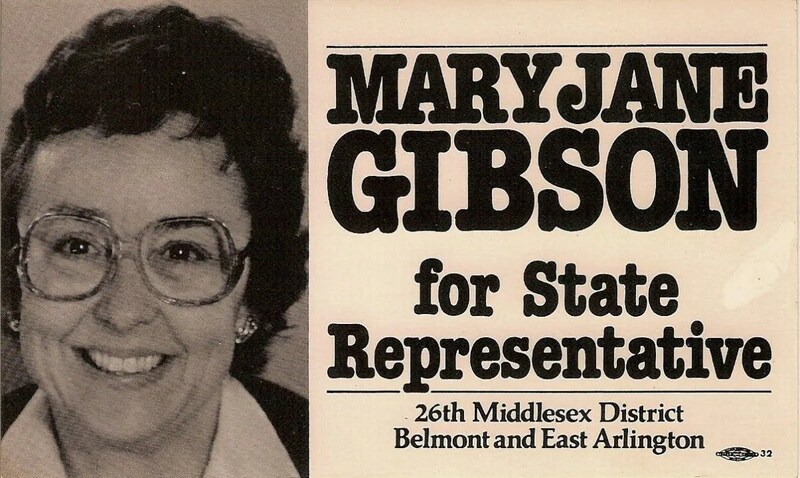 Mary Jane Gibson served in the House for one final term until her retirement in 1992. After finishing her term in the legislature, Mary Jane retired to Eastham, Massachusetts but continued to be a strong advocate for progressive causes. 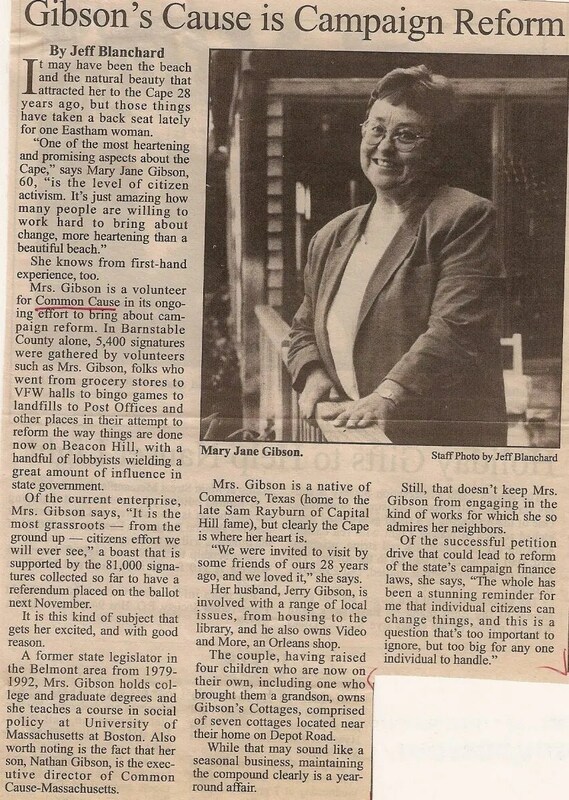 In 1993, she was profiled in the Cape Codder beause of her efforts on behalf of campaign finance reform. Mary Jane continued to be an activist organizing events for Senator John Kerry in his presidential bid in 2004 and organizing on behalf of State Representative Sarah Peake. We fondly remember some of Mary Jane’s outstanding supporters and staff: Nancy May, Helen Doggett, Joan Kerzner, Lillian Blacker, Ellen Stevens and Joanna Hilgenberg. Lillian F. Blacker, 59, director of the Harvard Medical Area News Office, died of a brain hemorrhage Wednesday night at Mount Auburn Hospital. Mrs. Blacker, who held the Harvard post for 14 years, was well-known within the university’s medical institutions and among science journalists nationally. A 31-year resident of Belmont, she was also prominent in town governance. In the late 1970s she was editor of the Belmont Citizen, a weekly newspaper. “It’s hard to imagine a Democratic event in Belmont without Lillian,” Rep. Mary Jane Gibson (D-Belmont) said yesterday. Born Lillian Friederman in Roxbury, Mrs. Blacker attended Girls Latin School and graduated from Radcliffe College in 1952. In 1955, she married Edward Blacker, who retired in 1986 as director of alcoholism programs at the Massachusetts Department of Public Health. While raising her three children, Mrs. Blacker became involved in local politics. She worked for fair housing and founded an interracial day camp for city and suburban children. She was instrumental in gaining passage of roll-call voting for the town meeting, and was vice chairman of the town’s Warrant (finance) Committee at the time of her death. In addition to her husband, Mrs. Blacker leaves three children, Joshua of Los Angeles, Elissa of Belmont and Daniel of Washington; and a sister, Miriam Cohen of New Rochelle, N.Y.
Services will be held today at 11 a.m. in the Levine Chapel in Brookline. Each year, the Belmont High School English Department selects three outstanding senior these to receive the Lillian F. Blacker Prize for Excellence in Writing. BELMONT – Ellen (Aidenhead) Stevens, a lifelong Belmont resident, died Saturday, Oct. 15, 2005, at her home surrounded by her children. She was the wife of the late Samuel A.C. Stevens, who died in 2000. She was born on June 28, 1939, in Providence, R.I., and grew up in Belmont. She attended the Mary Lee Burbank School. After graduating from Belmont High School in 1957, Mrs. Stevens attended Mt. Holyoke College where she received a degree in sociology and anthropology. She went on to earn a master’s degree in secondary education from Tufts University, and a master’s degree in African studies and anthropology from Boston University. She completed the coursework for a doctorate in anthropology from Boston University. Mrs. Stevens taught anthropology at Boston University and Milton Academy before moving on to a career in fund-raising. As a professional fund-raiser, Mrs. Stevens supported the important educational and cultural goals of many Boston-area higher education institutions, as well as the Massachusetts Historical Society. She was associate director of Leadership Gifts and senior director of Major Gifts at Boston College; a director of the Harvard-Radcliffe Parents Fund at Harvard University; director of Development and Alumnae Affairs at Radcliffe College; and director of Corporate and Foundation Relations at Brandeis University. Most recently, she served as director of the first capital campaign at the Massachusetts Historical Society. Mrs. Stevens served as a Town Meeting member for over 20 years, during which time she also was on the Warrant Committee. Recognizing the need to adequately fund the Belmont schools, Mrs. Stevens co-founded the Belmont Education Foundation, and also served as vice president and president. Working to maintain and enhance open space in Belmont, Mrs. Stevens was a member of the McLean Land Use Task Force and a founder and board member of the Belmont Land Trust. She was also active in the League of Women Voters, the Belmont Civic Association, and the Belmont Democratic Town Committee. She also served as a board member for Travelers Aid/Boston and was a member of the Patron’s Gift Committee at the Museum of Fine Arts, Boston. Mrs. Stevens spent her summers in New London, N.H., along the shores of Lake Sunapee, with her family and relatives, reading, relaxing and playing tennis. She shared her fund raising experience with nearby environmental organizations, serving several terms on the board of the Lake Sunapee Protective Association and the board of the Friends of the John Hay Estate. Later, she and her husband traveled to Italy, France, Sweden, Norway, Denmark, England, Southern Africa, Indonesia, Thailand, Australia and New Zealand. Following her husband’s death, she continued to travel, visiting such places as London, Paris, Alaska, as well as her friends and family around the United States. She is survived by two sons, Nathaniel Stevens of Arlington, and Tyler S.C. Stevens and his wife, Molly A.E., of Green Mountain Falls, Colo.; a daughter, Mary-Priscilla Stevens and her husband, Erik Schneiderhan, of Madison, Wis.; four grandchildren; and a sister, Jean A. Smith of Lyme, N.H.
A memorial service was held at 11 a.m., Wednesday, Oct. 26, at the First Church in Belmont, Unitarian Universalist, 404 Concord Ave., Belmont. The following appeared in Belmont Citizen Herald in June, 2011. The following letter to Ann Landers appeared May 3, 2000. And for more information about Nathan S. Gibson, please visit Nathan S. Gibson. How fun to come across this info on Mary Jane who I am happy to say is my mentor as I get to know the workings of the Ella Lyman Cabot Trust – as its administrator. Thanks Michelle! I’ll be sure to mention it to her. I think everything ssaid made a great deal of sense. However, what about this? what if you werre to create a awesome title? you added a title tat grabbed a person’s attention? I mean Re-elect Representative Mary Jane Gibson – Nathan S.
see howw they create news titles to get viewers to click. excited about what you’ve written. In my opinion, it could bring your blg a little livelier.